Good old fashion country music. This is Steve's fifth CD. All songs are written by Steve, Paul Marshall and Karen Tobin. Good old fashion foot stomping tunes. 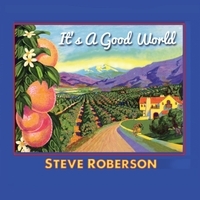 Steve is a real estate broker in Downey California, but loves singing and recording music. All proceeds going to Easter Seals Southern California. I just listened to the new CD as well as recently heard Steve in concert. None of this new "crossover" gibberish but the real thing! So refreshing to have the undiluted soul of country speak through his music. He is on a roll hitting the right cords with CD after CD. I could tell by the hundreds of fans in the crowd , that day, that I saw his fans share his love for the authentic, the genuine and the nostalgic feel of what country SHOULD be and CAN be. Thanks Steve for being true and faithful to the old fashioned country feel! Rock on my friend.